Take your go-to beauty regimen to go with this exclusive travel kit from Health and TULA Skincare, the probiotic beauty line founded by Dr. Raj. 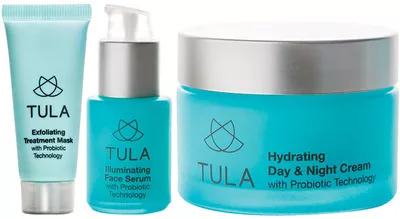 Take your go-to beauty regimen to go with this exclusive travel kit from Health and TULA Skincare, the probiotic beauty line founded by Dr. Rajapaksa, who pens the monthly "Our Doc Will See You Now" column. "Taking time for yourself and being mindful of exercise, sleep, and eating habits will help you achieve balance, which is the foundation of health," says Dr. Raj. "With TULA, I created a line that contains good-for-you ingredients that nourish and protect your skin." A dual-phase treatment that gently exfoliates dead skin cells to reveal a hydrated, dewy complexion. This easily absorbed formulation promotes even skin tone, helps diminish the appearance of dark spots and maintains a fresh, youthful-looking glow. This lightweight moisturizer nourishes and hydrates skin while reducing the appearance of fine lines. To buy: Visit tula.com/healthmag to order the collection. And don't miss this special offer: For a limited time, you can get the entire kit, which is valued at over $100, for just $72. Use code HEALTH25 to receive an additional 25% discount.